When working in two point perspective in an interior space, the horizon line and other construction lines are often obscured. One must remember that the convergence lines that create the side walls are crossing over one another and recede to the vanishing point on the opposite side of the page. The best way to start drawing an interior space in two point is to first put in the vertical line of the back corner as it relates to the horizon line. You can tell how much of the vertical line in the corner falls below and above the horizon line by noting where your eye level is in relation to it. When you have made this proportionally correct, then you can find the angles by comparing to a horizontal (see Linear Perspective-Exteriors (two point)) and extending the angled line from the top or bottom of the vertical until it meets the horizon line. This is a vanishing point for all parallel planes. Go through the same process with the other wall. All planes that are parallel will recede to the same vanishing point. Divisions in the floor are best approximated, then carry convergence lines back to their respective vanishing points. 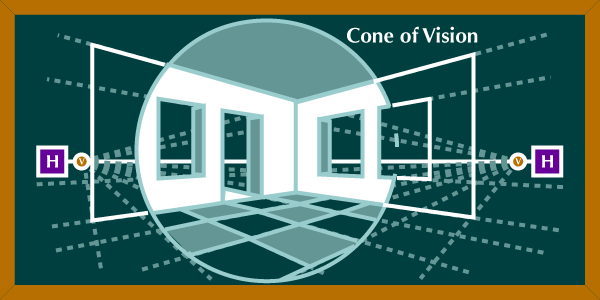 Remember that you are working within a cone of vision. Adjust your drawing so that all of the information is within this cone, otherwise you will have some distorted areas. A good example of two-point perspective occurs in the work of Jean Béroud's La Pâtisserie Gloppe au Champs-Élysées from 1889. The two distinct wall planes make up the architecture and rely on two separate vanishing points.